Watching in awe as jagged pinnacles of ice break free from their parent glacier and slide majestically into the water, the resulting mini-tsunami undulating toward us across ice-strewn water. Gripping the gunwales as a vortex of spume whisks our inflatable away from the base of a thunderous waterfall. Paddling our kayaks through jade-green waters so thick with salmon they obstruct our passage. 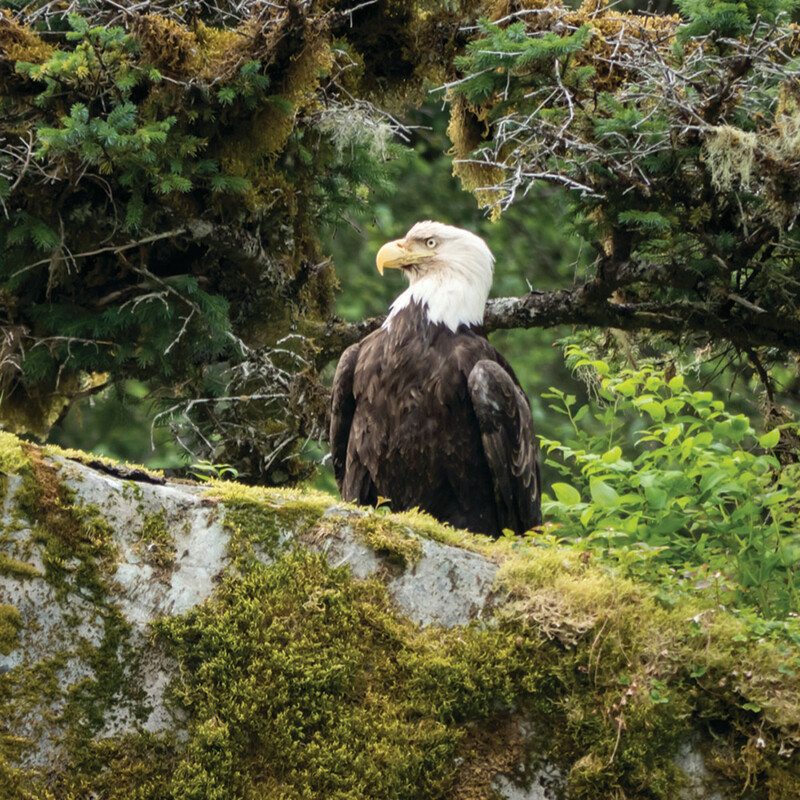 These are just a few of the memories that linger from a visit to Prince William Sound—the jewel in the crown of Pacific Northwest cruising. 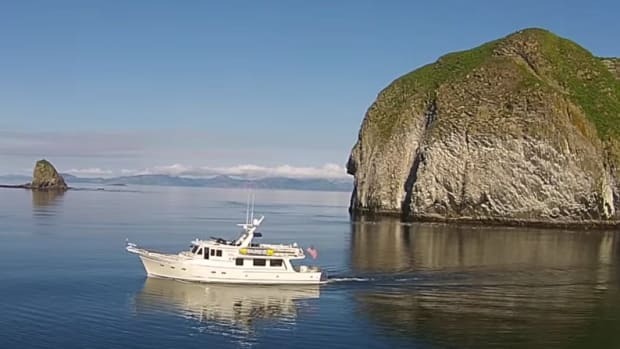 Located 50 miles southeast of Anchorage, this gem of a cruising ground is not easy for the average cruising boat to reach. 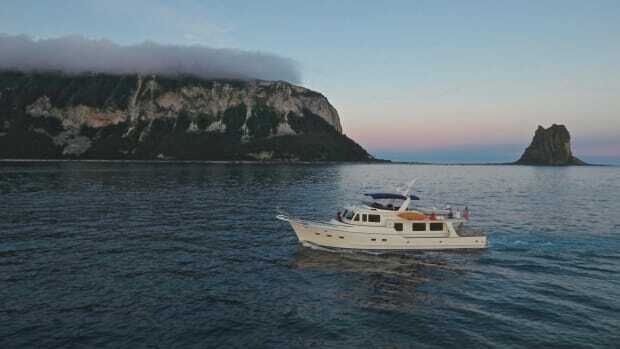 We untie Venture’s lines—my “experienced” Fleming 65—from our base at Sidney on Vancouver Island and follow the Inside Passage to Cape Spencer, just west of the entrance into Glacier Bay. 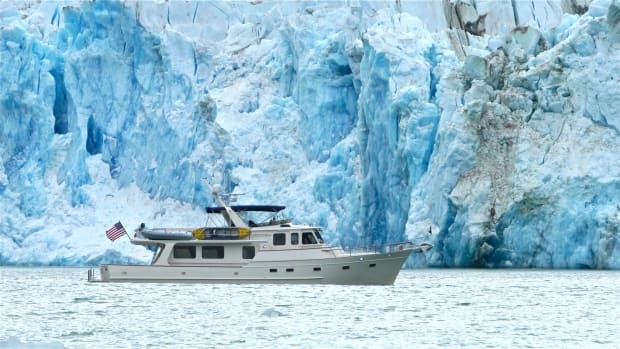 The next 400 miles require navigating the open waters of the Gulf of Alaska and, given its reputation as a breeding ground for nasty conditions, it is essential to wait for a suitable weather window. Our first stop, Lituya Bay, lies only 40 miles north of Cape Spencer. Its beauty belies a sinister reputation. In 1788, two skiffs and 21 men were lost while attempting to survey the treacherous entrance. Jean-François de Galaup, Comte de La Pérouse—the French admiral leading the expedition—named the island in the middle of the bay Cenotaph Island—meaning “empty tomb.” In 1958, 90 million tons of rock and ice broke loose from the head of the inlet, creating a gravity wave that rose to a height of 1,720 feet and stripped vegetation along the length of the bay to bare rock. Another breathtaking view from the deck of Venture. 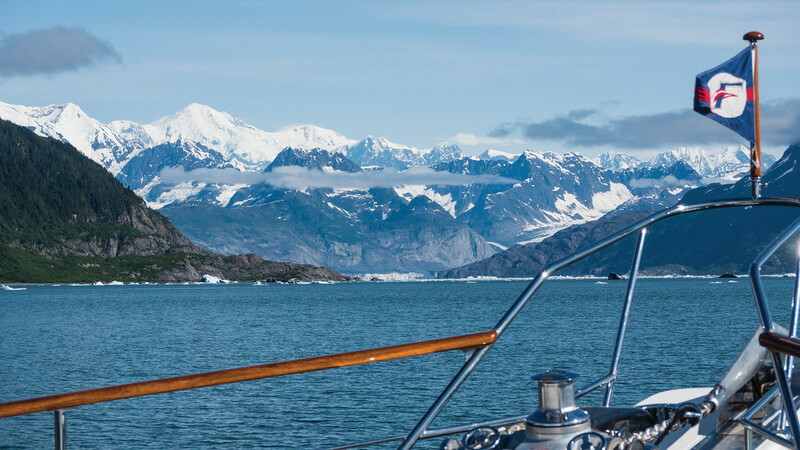 Our next stop is Yakutat, where we await a break in the weather and take a daylong excursion to the Hubbard Glacier, some 30 miles up Yakutat Bay. One of the very few glaciers bucking the trend by expanding instead of retreating, Hubbard Glacier is six miles across, making it the largest glacier in North America. 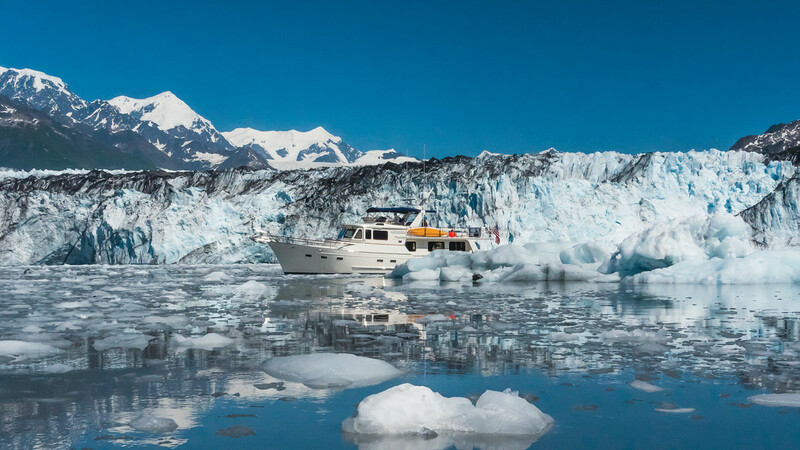 The outgoing tide allows us to approach within one-quarter mile of the glacier’s face. We reverse course as the tide turns, but we’re almost too late as the flood brings with it quantities of floating ice that threaten to entrap us. From Yakutat we head directly for Prince William Sound. Along the way we pass the major landmark, Kayak Island, which projects well into the Gulf of Alaska at dramatic Cape Saint Elias. This island was the site of Vitus Bering’s 1741 landfall on what is now the Alaskan coastline. After 10 years of preparation for his expedition, Bering spent only 10 hours here before heading back to Siberia. His ship was wrecked on the return journey, and he is buried on the island that now bears his name. Quite by chance, Captain James Cook also made landfall on the same island 37 years later, during his search for the Northwest Passage aboard his ship, Resolution. 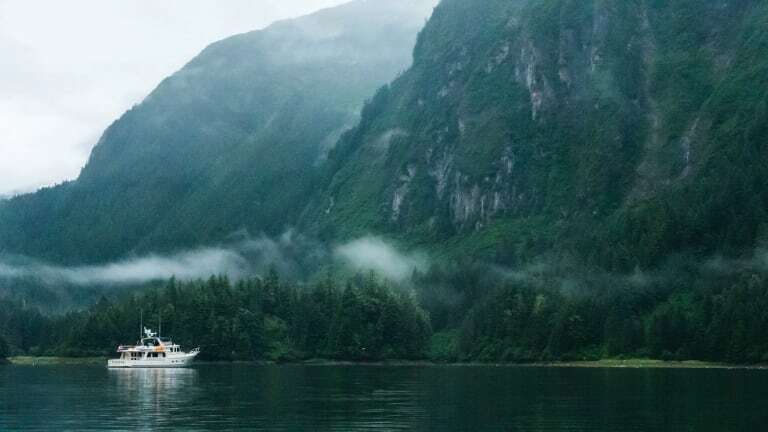 With an area of 7,000 square miles and an 18-foot tidal range, Prince William Sound has enormous quantities of water flowing in and out—much of it through Hinchinbrook Entrance. A southerly gale meeting an ebb tide at this spot can turn this channel into a maelstrom, so timing and conditions are essential considerations. 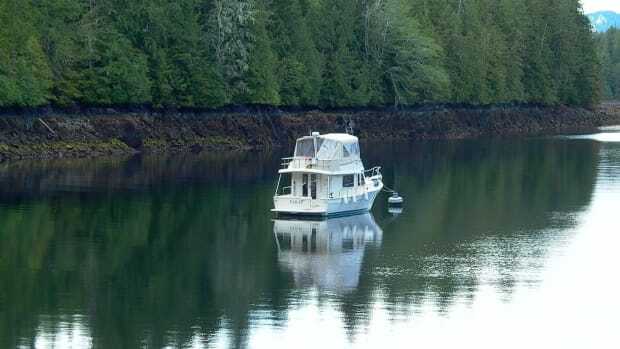 We decide to head directly to Columbia Glacier on the northern side of the sound, and we spend the night in a mirror-calm anchorage where the surrounding mountains and even the flying gulls above are reflected in the still waters. 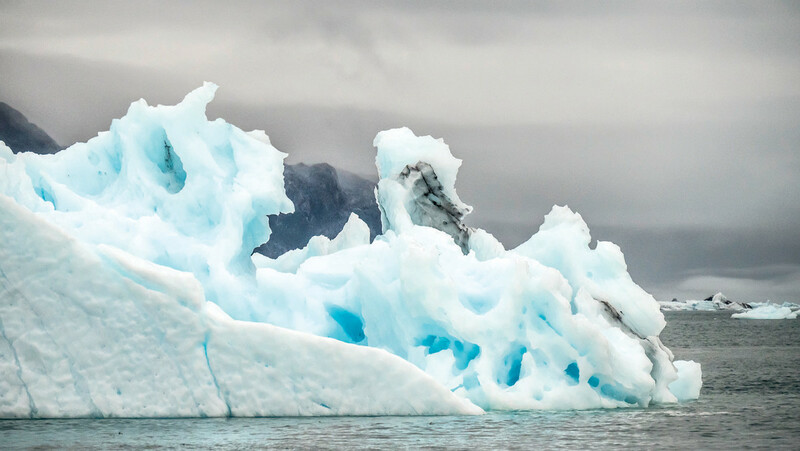 During a previous visit to the Columbia in 2013, ice in the channel had prevented us from approaching—or even catching sight of—the glacier face. Today is a different story; under sunny skies we wend our way among myriad ice floes to within a safe distance of the face. We pass upward of 30 sea otters hauled out on one floe and a similar number on another. The animals warily watch our progress and we keep our distance. The Columbia began its catastrophic retreat during the 1970s—receding 10 miles in 25 years. The disastrous grounding of the Exxon Valdez on Bligh Reef in the spring of 1989 was triggered by ice from this glacier blocking the outgoing ship channel, requiring the tanker to divert into the incoming channel. It was the failure to revert to the outgoing route in a timely manner that caused the grounding. 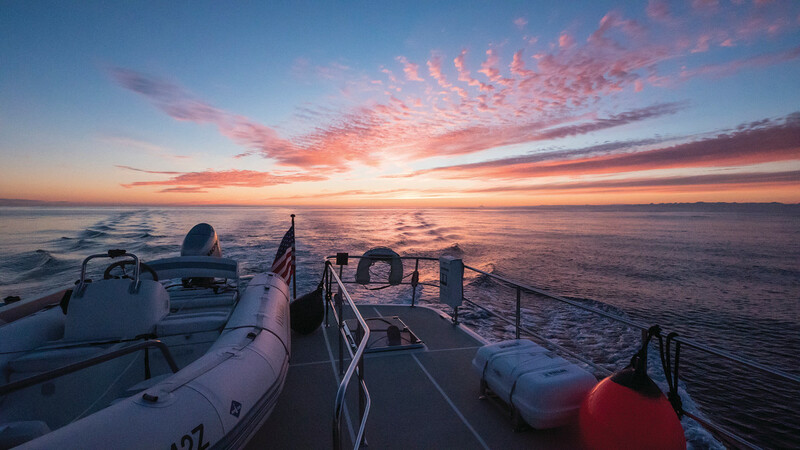 To see this for ourselves, we decide to follow the tanker’s exact route over the reef—which we safely accomplish with 60 feet of water beneath Venture’s keel. The reef and nearby Bligh Island are named after William Bligh, who would later become infamous as the captain of HMS Bounty. He was master of Cook’s ship Resolution when he visited Prince William Sound in 1778. We do a drive-by through Snug Cove where Cook careened and re-caulked his ships. Reports state that some planking seams had gaps 2½ inches wide and had to be caulked with rope. We call at the town of Cordova, which we have visited twice in the past. Fishing, an industry upon which the town depends, is rigorously controlled in Alaska. Fish farms are illegal and stocks of wild fish are bolstered by juvenile fish released into the wild from hatcheries. Salmon returning from their time in the ocean are evaluated from aircraft, through sample catches, and even by counting individual fish as they make their way up the rivers. Based on the numbers, openings are allocated to different boats in different areas for specified times. We are lucky to have become friends with Robert, a local fisherman, who generously offers to take me and another Venture crewmember, David, out on his boat. Known as a bowpicker, this kind of boat can be trailered and operated by one person. Robert picks us up at 5 a.m. and runs us out through shallows, known as “the flats,” to the designated area for an opening scheduled two hours later. At exactly that time—and not one second earlier—Robert deploys his net. After an hour, most of which is spent trying to chase off a couple of seals munching on trapped salmon, the net is reeled in, the fish retrieved and iced. During this 36-hour opening, the catch is delivered at intervals to strategically placed larger vessels, called tenders, that act as collection points for the fish processors. After five hours, a float plane retrieves David and me, returning us to Cordova by way of a 40-minute flight over the Copper River Estuary, surrounding glaciers, and jagged mountains. Cordova is one of three significant towns on Prince William Sound. It has a commercial airport, but no road connects it to the outside world. Valdez, one of the other main towns, is the terminal of the Trans-Alaska Pipeline and a loading point for tankers taking crude oil to points south. In March 1964, 25 years before the Valdez disaster, the old town was wiped out by a tsunami that resulted from a magnitude 9.2 earthquake, which also nearly destroyed Anchorage and many other Alaskan towns in its path. But the story of Valdez was especially tragic. The town dock was crowded with residents and their children gathered to greet the first supply ship after the long winter when a huge wave, measured 67 feet high in nearby Shoup Bay, lifted the ship and dropped it on the dock. No one on the dock survived. The town was moved to its present location on more stable ground. The third town, Whittier, was built as a military outpost during World War II. It lies at the head of Passage Canal, which is actually not a canal as we normally understand it but a scenic natural waterway. The town is surrounded by tall mountains and rests in the shadow of Whittier Glacier. The military bored a 2½-mile tunnel through Maynard Mountain, and for many years the town was only accessible by rail or by boat. In 2000, a single-track road was built and it put Whittier within a one-hour drive of Anchorage. Whittier has two marinas and the waiting list for them is 14 years long. Being unable to wait so long, we are instructed to side-tie alongside a venerable charter boat named Discovery. We are able to refuel here—the first opportunity to do so since leaving Juneau—with fuel delivered to the town by rail. There are no facilities here for re-provisioning. Whittier has no commercial airport, but its road and rail connections make it a calling point for cruise ships and the gateway to the scenic western side of the sound. Names for many of the numerous glaciers and waterways in this area were coined by the 1899 Harriman Expedition. One major waterway was named College Fjord with Harvard and Yale Glaciers at its head. Side glaciers leading into the fjord were named after women’s colleges to the northwest and men’s colleges to the southeast. Our first visit outside Whittier is to Blackstone where meltwater from hanging glaciers cascades past black cliffs patrolled by seabirds. Known locally as “Deathtrap,” this formation features walls of hanging ice that lie out of sight of anyone at the base of the cliffs. Should they let go, the first—and last—you’d know about it would be when tons of ice hurtle down from the sky. We head up College Fjord to Harvard Glacier and are surprised to see our Whittier dock companion, Discovery, surrounded by heavy pack ice and perilously close to the face of the glacier, or so it seems at first glance. Distances are deceptive, though, especially when it comes to glaciers. They may appear to be within half a mile when the radar obstinately insists they are six times that distance. We slowly nudge our way through dense but loose floes with the occasional thump and crunch. We pause to collect a piece of ice as clear as crystal that we plan to use to cool our drinks. Our slow progress is accompanied by cracks and booms from the glacier. I stand, with trigger finger on the camera button, ready to capture a significant calving. Over the following days we visit other glaciers: Bainbridge, Chenega, Cascade, Barry, Coxe, and Surprise. The last one produces the most satisfactory calving but only after a four-hour wait. 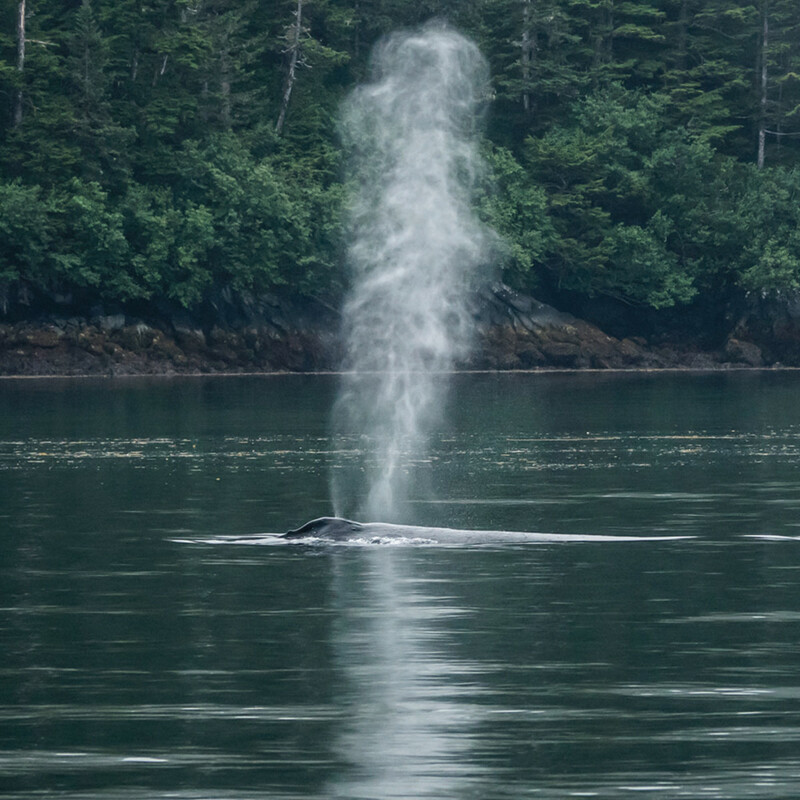 Along the way we encounter humpback whales feeding very close inshore. They float just beneath the surface and are the masters of heavy breathing; their blows create fountains of mist that hang like specters in the still air even after the animals have moved on. We rendezvous with Bruce, an Anchorage resident we met on a previous visit. Our vessels raft alongside in beautiful Barnes Cove on Knight Island. Bruce is an ardent fisherman and presents us with shrimp, halibut, and salmon. 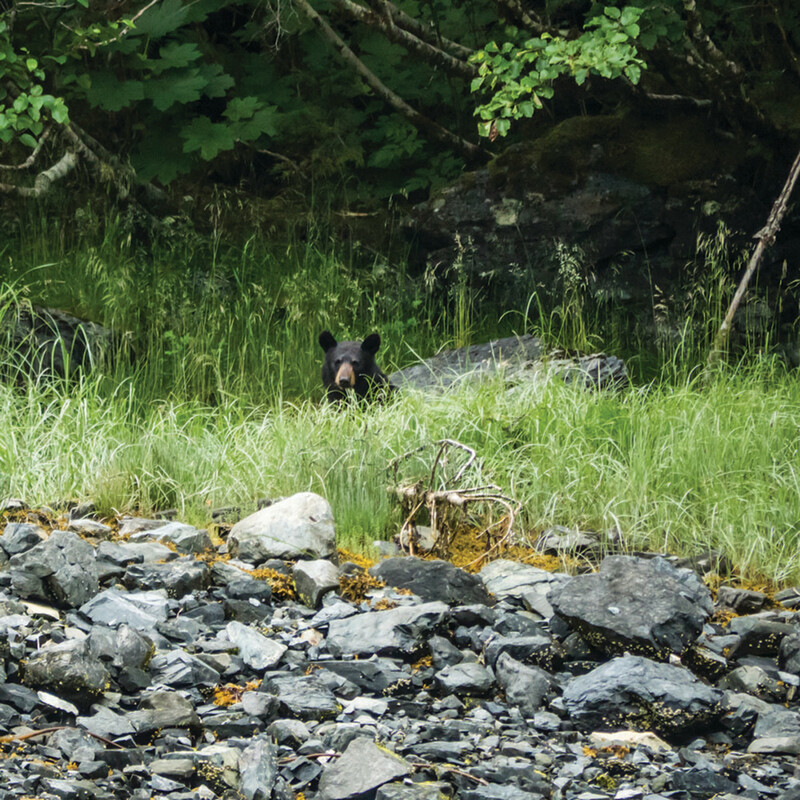 We see three black bears foraging along the shore. 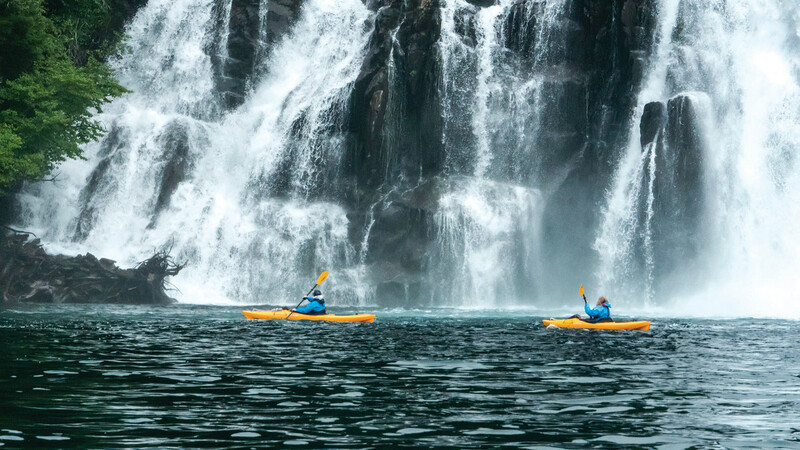 Along with the glaciers and plentiful wildlife, a predominant feature of Prince William Sound is its waterfalls. The largest by volume is in aptly named Cascade Bay. We are able to anchor and take kayaks and the tender close to the base of the falls. Each time we travel to these northern latitudes there is less snow, and the falls, although still impressive, lack the volume and splendor we remember from past visits. Less snow means less water, and reduced flow from the streams makes it a greater challenge for returning salmon to swim upstream. They congregate in staggering numbers waiting for high tide to ease their passage. 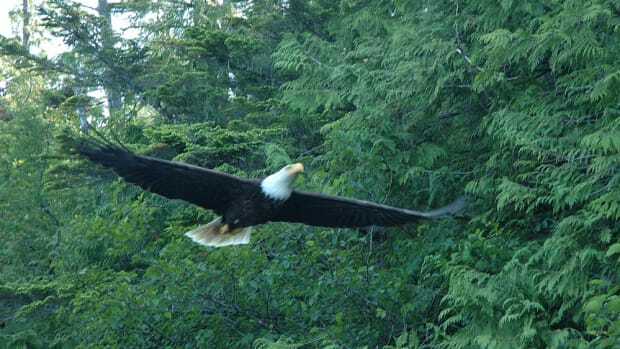 Seals patrol the waters while bald eagles perch on the trees awaiting their chance to seize a returning fish. The beauty of Prince William Sound is breathtaking, but past disasters have left their legacies. The 1964 earthquake raised parts of the sound by as much as 35 feet and sank other areas by 8 feet. Saltwater intrusion created cemeteries of dead trees known as “ghost forests.” Little visible evidence of the Valdez spill remains, but the linchpin herring population has never recovered, and the orcas are in trouble as well. The resident orca pod is down to just seven animals, with no breeding female. After exploring Prince William Sound, we set back across the Gulf of Alaska, stopping only to take photographs at Cape Saint Elias on Kayak Island. And then, after several months exploring Alaska, we point Venture south and start the long journey home to California. 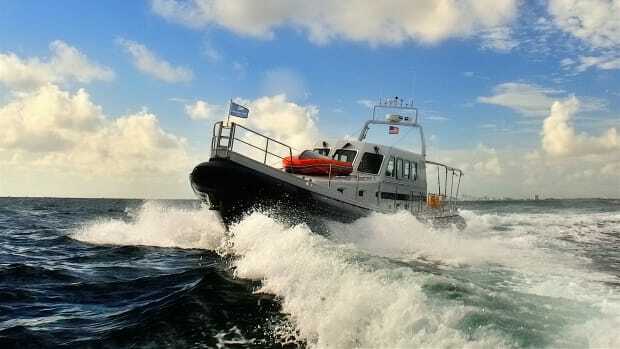 See more videos from Tony Fleming on the Fleming Yachts Youtube page.